I love strawberries. I’ve tried growing strawberries, but the wildlife in my yard always outsmarts me and eats the ripe ones before I can get to them. We always have at least a pint in the fridge at all times. I love strawberry shortcake, but it is not my families favorite. So I tried this recipe. I have made GF pie crust from a box and it was good, but for this one I made my own. I like to use just rice flour for this crust recipe. The crust hold up well and is not soggy. The best part of this recipe is the goo. It makes lots of goo! Plenty to lick off the spoon and maybe mix with some So Delicious Coco Whip. Preheat oen to 375 degrees. Mix together crust ingredients. Press mixture into the bottom of a greased pie plate. Place water, sugar, and cornstarch in a pan over medium heat and stir until thick and clear. Add jell-o to sugar mixture. Add the strawberries to the jello/sugar mixture. 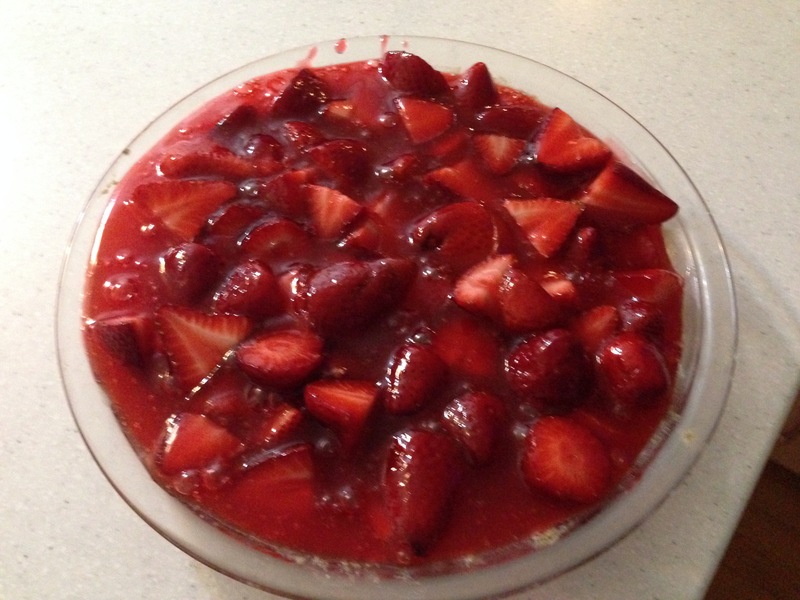 Scoop the strawberries into pie shell and top with more of the sugar mixture. Place pie in refrigerator until cool. Looks delicious, how did you like the crust, I haven’t tried a crust w just the rice flour, looks like a great idea! The crust was good. I’ve used a few different flours, sweet rice is my favorite and goto choice. Glutino’s box pie crust is the box mix I use the most.